In its most recent monthly rating of real estate activity, Seattle-based Zillow has Roseville's three zip codes as ranging from cold to very hot for real estate sales activity. For the period ending July 31, zip code 95661, was rated as cold, while 95878 and 95747 are both rated as very hot. Anything hot or higher is considered a sellers market. Zip code 95661, is reported to have a median home value of $445,200 and in terms of resale activity is rated cold. According to Zillow, home values in this 95661 are up 8.3-percent over the last 12 months and are expected to increase 5.2-percent over the next 12 months. Any market rated above hot is considered to be a sellers' market. Zip code 95678 was rated very hot for the period ending July 31, with median prices listed as $361,500. Price growth over the last 12 months is 8.8-percent and an increase of 5.2-percent is forecast over the next 12 months. The City's third zip code, 95747 continued to be rated very hot with a median price of $450,200 and with a 8.0-percent price increase in the last 12 month reporting period. Over the next 12 months, housing prices in this area are expected to increase 5.2-percent. 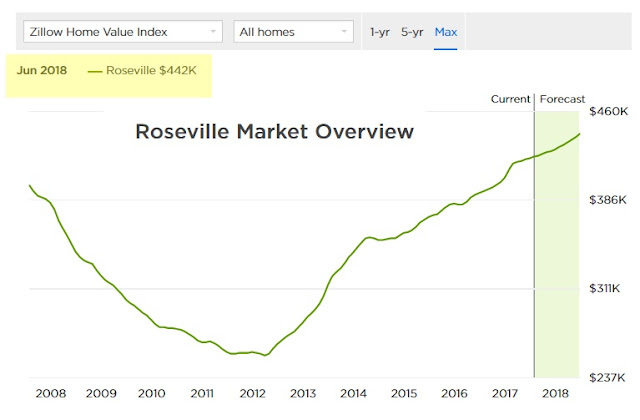 In all three Roseville zip codes, housing prices have steadily increased since bottoming out in March 2012. Zillow overall rates the Roseville real estate market as neutral with a citywide median value pegged at $442,000.